Hello! Hopefully you’ve landed here because you want an animation or illustration made. We know it can be hard to choose someone to work with. You need to be sure your production company will provide exactly what you want, with a process as smooth and delightful as a Mr Whippy. We stand by our record and know that once you start working with us, you’ll know you’ve made the right choice. 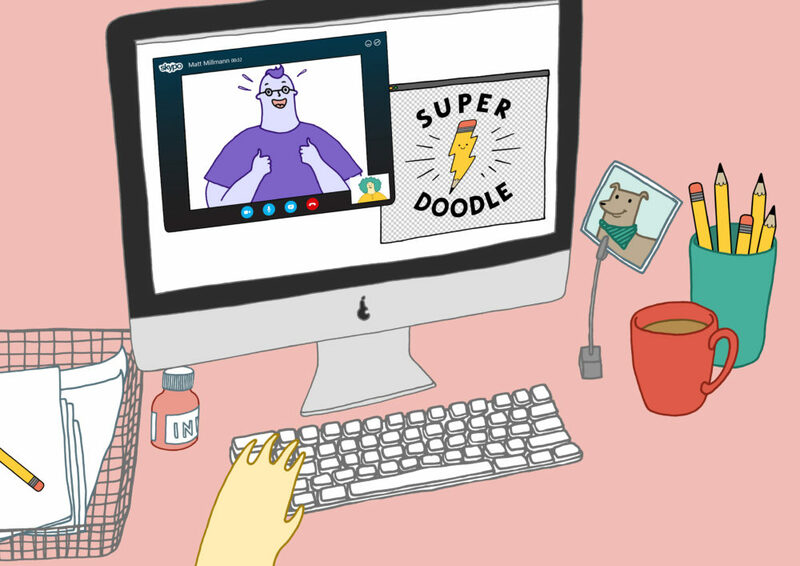 At Superdoodle, we’re made of equal parts creative and logistics. So we can handle everything from proposal to concept to sketch to final delivery. We want to make working together an awesome experience. It’s an exciting time – we’re bringing something to life! We always open with a chat to learn about your project and start weaving some super solutions for you. We can show you past examples of our work, and create reference packs stuffed with ideas and doodles. Let’s chat! We create all kinds of animations and illustrations, for all kinds of clients. Our initial chat helps us learn about you and your project, and how we can help. We’ve been developing creative projects for years now, so we’re confident in estimating timescales and budgets. All projects are different, though, and prices may vary depending on what you need. If you’re interested in working together, we find it useful if you’ve prepared your ideal and maximum budgets so we can more accurately estimate suitable solutions. Once we’ve gathered all the basic information for your project, we’ll create a rough schedule outlining how long each stage should take. Contracts are extremely important for both large and small projects – they look after us both and outline the work that’s about to be carried out. A 50% initial fee needs to be paid at this stage. Adminy bit over, now it’s on to the fun bit! If you’re supplying a script and/or voiceover (VO) for an animation, we need to take a peek at this point. We always make sure the narrative is nice and coherent before we do anything else. Script: Some clients come to us with prepared scripts, others just have a vague idea of what they’d like. We can get one of our writers on board if you need help, but if not, we’ll jump straight into creating a ‘visual script’. 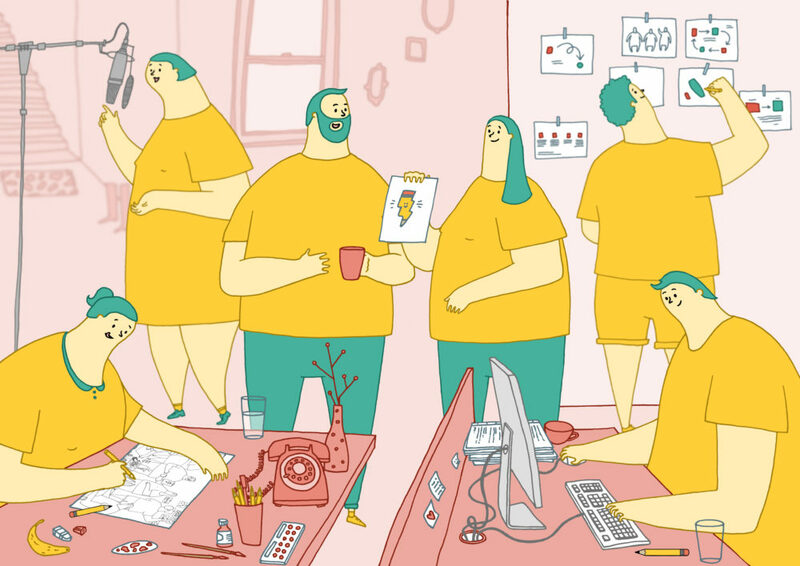 This is where we work out how to animate your idea in an engaging and snappy way. We may write a few different versions and discuss with you what you do and don’t like, so we can perfect the tone and message. VO: You may already have a VO recorded but if not, we can help! Be it male, female, young, old, sassy or squeaky; we can help you find the perfect voice for your project. If you have any VO references, it’s helpful for you to send over a link so that we can help select someone similar. When you’re happy with the script or VO, we’ll start dreaming up ways to bring your project to life. 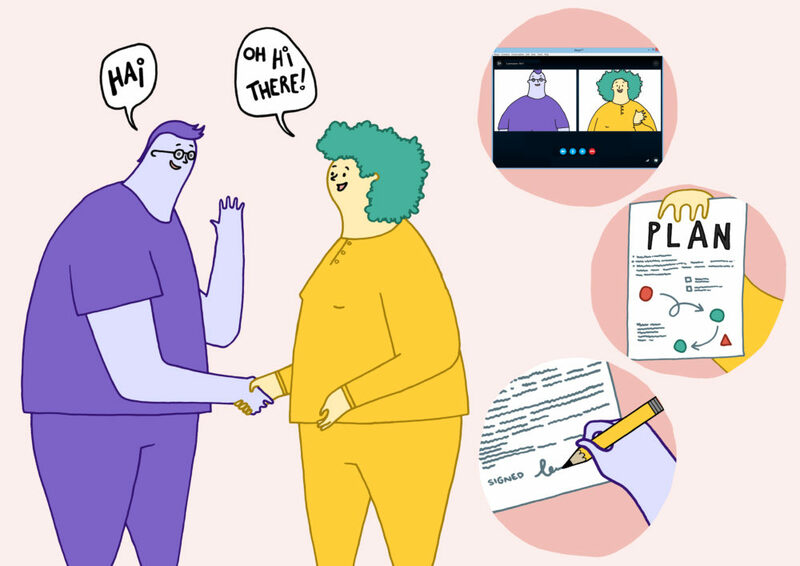 We’ll make you a reference pack full of selected images, colour ideas and doodles: we’ll start gathering together some visual goodies for the direction of your brief. Don’t forget to send us any reference material you’d like to throw into the pot too! Our reference pack will help us to eliminate ideas that don’t quite float your boat and, more importantly, zone in on styles and ideas that make you giddy with joy. Next we’ll make a start with some ‘roughs’ – sketching the characters and backgrounds. This stage is called ‘the roughs’ for a reason – it’s a quick process for us to put down some shapes and composition ideas, and to start bringing our imagined world to life. Storyboard: A storyboard is a set of rough illustrations planning the action and camera angles for each shot in your animation. Imagine a simple pencil-sketched comic strip. Animatic: An animatic is a video of the storyboard frames, presented alongside the audio of your animation. Its purpose is to demonstrate timing, flow and pace alongside key movements and transitions. At this stage in production, you’ll have the opportunity to review and feedback, and we can make sure you’re happy with the path we’re about to take together. Some of our smaller clients choose to skip this stage to save some time and money. We always advise it as an important stage of the process, though. Animation is time-consuming, so it’s great for us to discuss the storyboard/animatic together before we get going with production. It’s easier (and cheaper!) to ‘rough’ plan than to go back and amend final decisions. There’ll be a magical atmosphere in the office at production stage. Everyone has their head down, doing their best ‘concentration face’. You’ll hear pens scribbling on paper, a squillion clicks and taps on computers, and no doubt the constant bubbling noise from the kettle to keep us going. And we’re off! During this stage we’ll be steaming ahead: whether an animation or illustration project, we’ll be bringing your message to life with some super visuals. Unless you’ve already provided us with a full audio track, you may want to add in music and/or sound effects now that you can see your animation in all its glory. Music and sound effects really add an extra level of charm and impact to an animation. Music can enhance the flow of a piece, and sound effects can really make the visuals ‘pop’! We are big sharers here at Superdoodle, so will be sending you updates regularly throughout the production process. You’ll have plenty of opportunities to have a nosey at what we’re up to, and chat about our final goals. We will of course keep you up to date with any changes to the estimated schedule/budget. For animation projects, we require sign-off before sending over a final full-quality render.